For the second year in a row, Ms. Thess Aficial, a special education teacher in the US, spent a day of her annual summer break last 01 July 2017 to share with ASP the new on-the-job trainings that she underwent. Interest in her topic was high as evidenced by the relatively large number of participants who attended. This year she shared the Non-violent Crisis Behavior Intervention - a program focusing on the safe management of disruptive and assaultive behavior - with ASP participants. 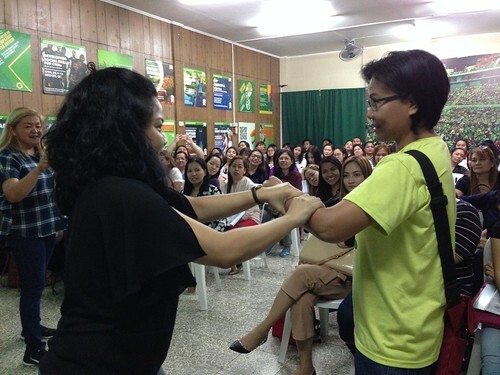 Teacher Thess started with showing the 2 kinds of aggressive behavior: Verbal acting out and Physical acting out. She then showed the usual causes and stages of crisis behavior. She explained that crisis behavior starts with fear and anxiety, the child then becomes defensive and then acts out. She stressed that it was important for the interventionist to remain calm, be an empathic listener and get to the cause of the child’s anxiety. Verbal intervention should always be used with verbal acting out and physical intervention should be used only for physical aggression. She then gave verbal techniques on how to deescalate behaviors at each stage, demonstrating words and tones that could be used to redirect the behavior to a more calm state. She also demonstrated the use of non-verbal behavior techniques such as kinesics (body language, motion, posture), and proxemics (positioning, space) to decrease tension. However, when the verbal acting out escalates to a physical attack, ensuring the child’s and the professional’s safety should always be the objective of the intervention. T. Thess showed and demonstrated ways of responding to and getting out when the child tries to hit, kick, bite, grab, pull, etc. She then explained the post-crisis COPING (Control-Orient-Patterns-Investigate-Negotiate- Give) model to be able to prevent or better respond to the individual’s crisis behavior. “Reading is the process of looking at a series of written symbols and getting meaning from them”. Reading is an important means of learning about the world around them. However, persons with autism sometimes find it difficult to learn phonetic reading or to extract meaning from words they are able to read aloud. Sight reading can become an alternative to phonetic reading. Students who are able to point, say/sign words and understand language, can be taught sight reading and to derive meaning from words. Teacher Thess demonstrated how to teach the child to match object to object, match picture to picture, match object to picture and finally matching word to picture. The sight reading technique she showed was based on the EDMARK Reading Program and the Star Techniques. She showed materials used through each phase of the reading program. The program is a scientifically based reading program using errorless teaching, positive reinforcement, manipulatives, oral and sight word vocabulary. As the child learns a new word,he will then build phrases and sentences and read stories. There should be continuous progress monitoring and documentation done. The program can also be used to increase vocabulary, comprehension and fluency. “Very good demonstration. The speaker did a step-by-step process."